Polemical writer of the seventeenth century. He wrote in 1634, in Latin, a book against the religion of the Christians, with the Hebrew title "Sha'ar Emet" ("Porta Veritatis"). 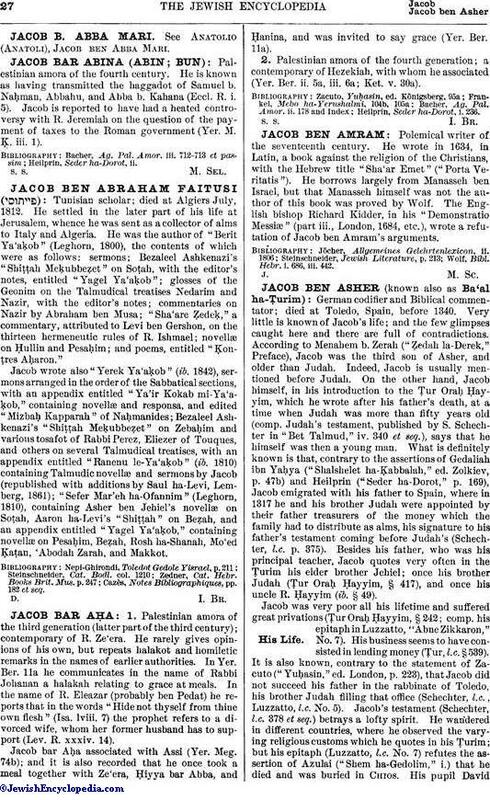 He borrows largely from Manasseh ben Israel, but that Manasseh himself was not the author of this book was proved by Wolf. The English bishop Richard Kidder, in his "Demonstratio Messiæ" (part iii., London, 1684, etc. ), wrote a refutation of Jacob ben Amram's arguments. Wolf, Bibl. Hebr. i. 686, iii. 442.